Community Center for the new village, located near the old Japanese Communications buildings (not visible). “The new village of Airai is a very recent phenomenon. It started in the late 50's, early 60's,” Walter says. “There had not been a Japanese settlement there, not in that area. The Japanese settlements were more on the other side of road, where they have those Japanese buildings, the old communications center. Some were over there, and then they were all the way out to where we have the new elementary school now. They had a lot of their living quarters all the way down toward the next villages." “Then after the war, people came looking for jobs. These are people originally from the other two villages of Airai that are on the east coast, across the bay: Ngchesechang and Oikull. The new village actually began as the settlement for those people. And now it is sort of mixed. “In the 60's what brought them was their kids going to school. The kids came to Airai, to the Airai village, and stayed with relatives. On weekends they’d go back home. It was hard. "In those days it was hard just transporting them. And for little kids, even starting the school, going away like that, it was also like a problem for a long while. Every Sunday they have to transport them by a raft or boat to Airai, with enough supplies for the relatives to share, foods and stuff. Then every Friday they brought them back to their village’s side." "Two-car capacity M-boat used before the Congress of Micronesia funded the Palau ferry in 1970." 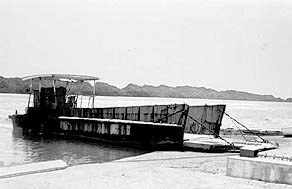 The M-boat was a WWII Landing Craft. Photograph from the Trust Territory of the Pacific Archives. “There was no road over from Oikull, they could only go by water. Going by land, it was the boonies, only the hunters could use that trail. Little kids would get lost in the woods, they would not make it. It was a rough territory there. A road was built in the 80's, but back then, they only used boats, and it was very hard. There is a dirt road over today, but in rainy weather you cannot go. “Then when the airport-building project started, that is when a lot of those people came to that new settlement to look for jobs too. That’s what made them decide to move over here, to go over there and build a new home in that place where their kids can stay and go to school while they looked for jobs. 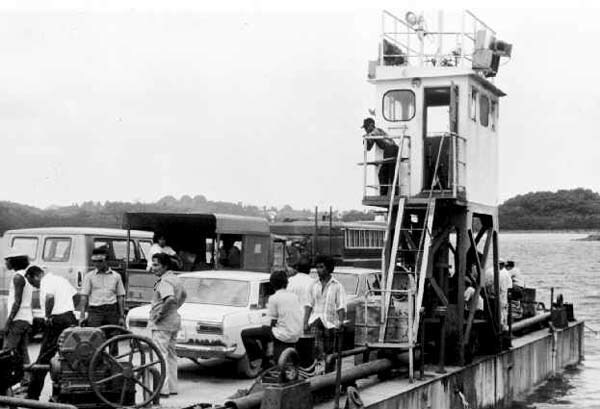 "Men and vehicles on board the Palau ferry, 1970." Photograph from the Trust Territory of the Pacific Archives. “But then the road was built. In those days before the bridge, they used ferry boats. That could hold I think 10, 20 cars. Before the ferry boat we used the M-Boat. It carried only a few. And then with the ferry boat, the road opened and people who came to Koror State from Airai State looking for jobs, once they had access. 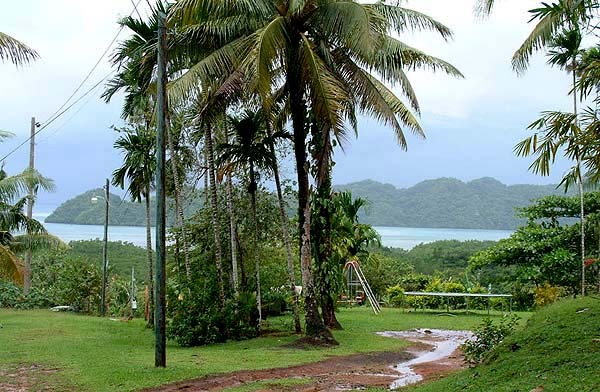 They would come back to Airai, then decide to move over there, and some worked in Koror." “Some found jobs over there, opened little businesses here or there. So they joined that group of people living in that new settlement area, and it kept expanding and expanding. 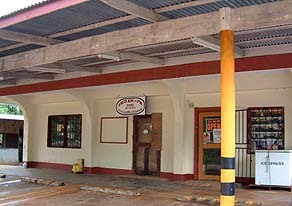 The Ked AM-PM store serves the new settlement. 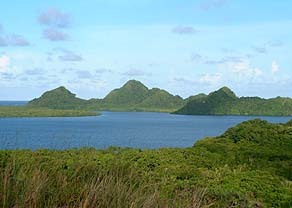 Oikull village sits in the center of this peninsula, across the bay from Airai village. “I myself am one of them, from Oikull. When I grew up to, I think it was 5th grade, they decided to build me a tin boat. We called it a totan—a Japanese word. It’s like a kayak but it’s made out of tin. And my mom was really worried about it, as every morning I went off. It was much faster. "I used to live in Airai, and then when I became a bit older, I was supposed to be more mobile, we decided to use those canoes. There was a guy who lived further up, he is now teaching in Airai. And he had a bigger kayak, he had 12-footer out of tin. And I had 8-footer. I waited for him every morning." "Boy in tin canoe." 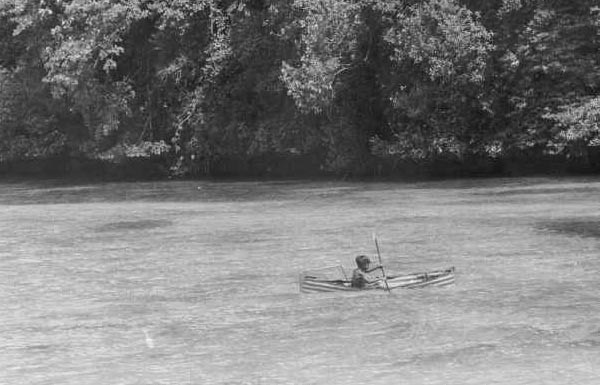 Palau—undated photograph from the Trust Territory of the Pacific Archives. “Another group went from the same village; they just used the bamboo raft. But for the guy who’s polling that thing, with this kids—he had three—oh man, if there’s wind or anything…. This guy was working for that rock quarry for the airport, and every morning he made it on time. Just before six a.m. we departed from the Oikull side. So I waited for him, but sometimes they went early because they used the raft. "Then I waited for the guy from the further-up village, and he came at maybe 6:00 or 6:30. We just put our clothes in plastic bags and then polled to the other side there and put the tin canoes up inland, and then just ran or walked up the ridge all the way up to the school. “In the 60's, my family relocated to where they’re staying now. Their parents, my father’s father died and mom lived with her sister. Because they are from this side too. They decided to come and take care of family there. So we decided to move here. And it became much easier, because after graduating from Airai Elementary School we had to come to Koror to go to the high school. "And in those days people had to poll their way across the channel and just walk. 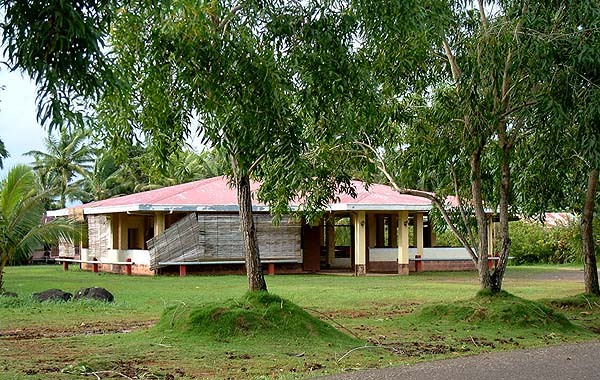 If you went to the public school, the Palauan school, we had dormitories and even sometimes, when the dormitories were full, then we had to stay with relatives. It was just like what we are doing before. " 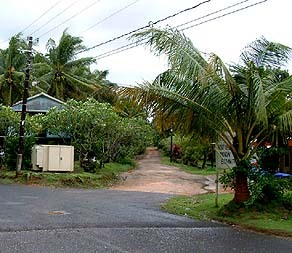 At the new village, a dirt road forks off from the main road to Airai village. 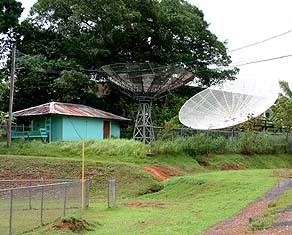 Satellite dishes behind a baseball field attest to the more modern character of the new village. "I stayed with relatives and I lived in the dormitory one time, where they have the Furusato restaurant. That was the kitchen. And then the dormitories were between where we have the Bank of Hawai‘i all the way to the Necco Plaza. But they have since leveled the area, so it’s much different. "When you go to Furusato Restaurant maybe you’ll see it, it still there, they just remodeled it. That is a Quonset hut. If you look at the side, you can see they just built and added to it. But it still remains. It is an American Quonset. That was where we ate." The new settlement sits on the hilltop overlookng the bay. "Most of the local Palauan leaders were fed through that mess hall. That was the only public school in the area, and it offered three meals." These young leaders would later have a major influence in shaping the governance of Palau.